Two weeks ago, I published “Inside Leni Robredo's international propaganda machinery”. The article featured emails published in the Yahoo! Group Global Filipino Diaspora Council (GFDC), a civil society group led by billionaire lobbyist Loida Nicolas-Lewis, her sister and former Commission on Filipinos Overseas chief Imelda Nicolas, and a several other extremely influential members of the Overseas Filipino community. First, that the Office of the Vice-president (OVP) actively controls its side of the ongoing propaganda war, as shown a forwarded email-directive supposedly sent by a certain Pete Silva. Second, that the OVP is supported by a network of influential and wealthy individuals – including the powerful Nicolas Sisters – who disseminate, promote, and/or implement these email-directives. The article quickly went viral in a few hours as it garnered hundreds of thousands of hits and tens of thousands of social media shares. Yes, it became a full-blown scandal. Vice-president Leni Robredo's office reacted just like how it did during the #NasaanSiLeni (#WhereisLeni) scandal of the preceding week [TP: Pregnancy Doctor], where it took the office several days to issue a clarificatory statement. Truth be told, I was not totally surprised by the glacial pace at which Robredo's PR Team works because one of my contacts in the Senate, who used to be aligned to Liberal Party (LP), explained to me that the standard operating procedure of many PR operators is to let the issue simmer for two to three days before issuing counter-statement. The problem, however, is that social media doesn't sleep. This SOP, while generally considered effective in the era of TV, radio, and print, doesn't work in the era of the internet, an era where people have access to content on demand. What's worse, the OVP's silence was further accentuated by mainstream media's failure to pick up the story right away. For two full days, not a single mainstream outlet wrote anything about it. Whatever mainstream's reasons are, this deafening silence only managed to magnify the OVP incompetence, whether real or perceived. (It) doesn’t have to be true, (it) just needs to look like that. But mainstream eventually picked it up, and how they treated the #LeniLeaks issue was nothing short of fascinating, and let me cite the most prominent ones. In his column, the Philippine Daily Inquirer's Oscar Franklin Tan called the #LeniLeaks issue a “bizarre nonstory”, as he focused on the ouster plot angle of my original article [Inq]. Tan has a penchant for writing Inquirer articles with clickbait titles, but this one was particularly sneaky. Specifically, Tan wasted no time citing Mocha Uson as a reference, despite the fact that it was my statements that he attempted to rebut. And how was I cited in his column? I was called “one”. Why did he do that? Well, if he said “Thinking Pinoy”, his readers would have visited my website. They would have seen that the issue is not the ouster plot per se, but Leni Robredo's shady propaganda email. The problem: the OVP email was #LeniLeaks' central topic and NOT the ouster plot. But of course, the ouster plot is easier to rebut, but the OVP email isn't, so why don't we just mention Mocha Uson and her alone? I guess Tan can't find an alibi for Pete Silva's OVP email. First, that there’s a call for Duterte’s resignation, but not a move for his ouster. On the first point, Former Ateneo School of Government Dean Tony La Vina is right when said that calling “for the President’s resignation is a free political exercise.” The problem, however, is that he conveniently forgot to mention that the ouster plot is NOT the central topic of my article. Instead, it's the OVP email from Pete Silva. Second, that Robredo and Lewis deny meeting in the US over the holidays, with Robredo claiming that the last time they met was in the first half of 2016. On the second point, Robredo's denial works only if she told the truth. But as De La Salle Professor Antonio Contreras pointed out, Robredo and Lewis met at an Overseas Filipino event held in August 2016, where Robredo was the keynote speaker while Lewis was a panelist [NYConsulate]. Third, that there is no connection between Pete Silva and the OVP so far. On the third point, I would concede that a connection between Pete Silva has yet to be established. But for the sake of argument and in consideration of the damning contents of that email, isn't it incumbent upon the vice-president to  deny that the email came from her office and  at least offer to investigate this email? 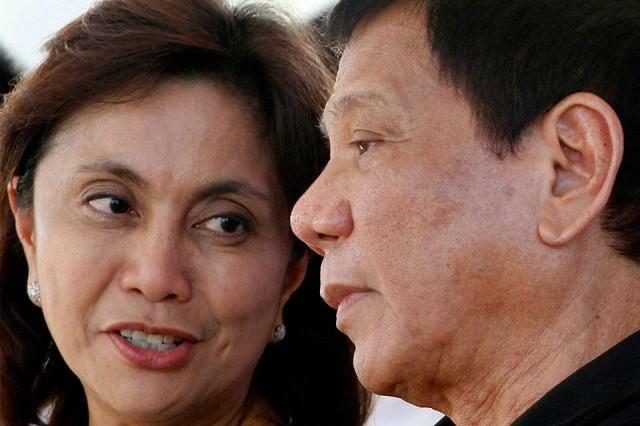 Not long after #LeniLeaks erupted, Robredo cried foul over her disinvitation from Malacanang's Vin d'Honneur, saying that “If they are mad at me, so be it. But they should have given my office a little respect [Inq].” Yes, Robredo wants her office to be respected, but she's fine with not denying the email and with Pete Silva using her office's name to propagate black propaganda? And just like the Inquirer, Rappler conveniently forgot to cite the source of #LeniLeaks. That's just like telling their audience that something is wrong, without telling them exactly what that “something” is. What is Rappler so afraid of? Surely, an unknown blogger is no match for Her Majesty Maria Ressa and her scales. Anyway, let's go to the third and final article. I saved the best for last. I can smell the fear among mainstream media men, but I found one dissenter who was brave enough to mention Thinking Pinoy: Businessworld's Greg Macabenta [BW]. The problem? Macabenta is not very smart and, to say the least, hyper. Macabenta's first twenty-or-so paragraphs were basically rants in the form of ad hominems, where he suggested that I was in the business of fear-mongering, so I skipped that part. After all, Macabenta already successfully made himself look like an idiot without my help.Suffice it to say, the first half of the article was mostly “pambalot sa tinapa”. What's interesting, however, was everything that followed next. Midway through the article, Macabenta acknowledged meeting with GFDC's members in Atty. Rodis' residence, something that my original blog post never mentioned. And his article went round and round this admission. I do not know if Macabenta has been sniffing glue, but it appears that he was rebutting a Thinking Pinoy article that he never read. Alright, so Loida's GFDC is alive and kicking, that's what I can deduce from this admission. But then, GFDC is not the focal point the original article, instead, it's Pete Silva's OVP email. But the ouster plot is easier to tackle, right? Just like Inquirer's Tan, Macabenta chose to fixate on the ouster plot, not the fact that the OVP may have committed a grievous ethical breach by using government funds to undermine the government. The discovery of the email-directive was solid. It's a solid story. It's just that these mainstream outlets hate citing social media blogs like mine because they are afraid of making us look more legitimate, and they're too proud to even paraphrase our discoveries. Too bad we don't need mainstream media's validation anymore. Pete Silva's email that was supposedly from the OVP and was forwarded by no less than CFO Chair Imelda Nicolas is the most important discovery in the #LeniLeaks emails. And did I mention that that email that also happen to have been published in pro-Leni pages Silent No More and Educators for Leni Robredo, on the same day that Nicolas received it? Today is the 22nd of January, or almost two weeks since the #LeniLeaks controversy blew up. As of this article's writing, the OVP has neither denied the authenticity of the email nor offered to investigate the matter. Did Tan, Rappler, and Macabenta – members of the mainstream media – find this detail so trivial, or are they just running out of excuses for Our Lady of Naga? Yes, mainstream media's half-assed treatment of the #LeniLeaks issue serves only to validate their personal political biases. Too bad everybody knows about #LeniLeaks already. If there's one thing that I realized during this whole #LeniLeaks saga, it's that the Filipino People hardly need mainstream media anymore. The public doesn't trust mainstream media anymore, and social media is starting to take over. As of January 2016, 74 percent of the 48 million Filipinos on Facebook are over 19 years old [WeAreSocial], that's about 35 million voters who get their first taste of the latest news on Facebook, and we expect more voters to join the platform as the internet penetrates an even larger part of the populace. The remaining 26%, who are aged 13 to 18, will reach voting age by 2022. That is, by the next presidential elections, around 48 million will be online. More than just exposing the duplicity of Vice-president Leni Robredo, #LeniLeaks showed us that mainstream media has finally lost its monopoly in information. With social media, the regular Filipino can be directly informed about the latest developments in the national scene. If Duterte's continually stellar satisfaction ratings [Sunstar] despite mainstream media's anti-Duterte barrage is to imply something, that would be the reality that most Filipinos have started to trust social media players more than their mainstream counterparts, as the strongest social media players right now – Mocha Uson, Sass Sasot, and ThinkingPinoy – are largely pro-Duterte. Mainstream media, of course, will not necessarily die. But I am pretty damn sure that it will just become a shadow of its former self. Mainstream media vs social media will be like Kodak vs digital photography. In 2016, we were witness to one of the most aggressive mainstream media ad campaigns of the presidential candidates. Despite the billions that Roxas, Poe, and Binay spent on ads, it was Duterte – who spent the least – who won the polls [TP: SOCE]. Yes, it appears that pol ads have lost their once-mythical efficacy, and I expect that trend to continue in future, as more and more people ditch mainstream media for online platforms. I think that by this point, most politicians have realized that expensive TV, radio, and print ads are not as effective as they were in the past, and I believe that in response, they will start recalibrating their campaign strategies in recognition of this development. The “2022 election wars” shall be fought online. Mainstream media companies, whose incomes rely heavily on political ads, are bound to suffer. That is, the news arms of mainstream media companies will most likely downsize in the not-too-distant future.